This electricity substation is on the corner of Smith Street and Flour Mill Way, in the inner west suburb of Summer Hill. The mural was painted by street artist Scott Marsh in 2016 and depicts the silos of the former flour mill nearby and the urban renewal of the former industrial site. 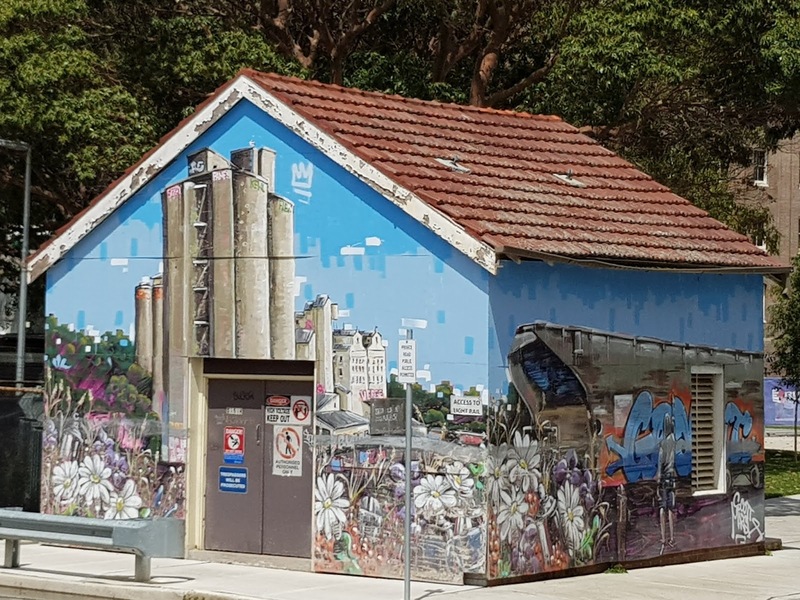 The interest in external murals is becoming widespread in the Australian and other blogs, but the appearance of silos on your shed is even more fascinating. What a brilliant way to disguise a substation. The artist has chosen his subject matter well. Yes, I do like that aspect. Hey a mural with silos instead of a mural on silos. It's very well done and I like the silos in the mural. Thanks for participating Jim. ...a lot going on with this little building. In a town near where I live, huge grain elevators are ALSO depicted in a mural. I don't think you can see both at once. I love these murals that depict the history. What a bit of art can do! The silo’s are in great contrast with the flowers but al looks very nice. What a brilliant way to revamp a building. It's a shame they never painted the soffat as the paint is crumbling. I ave seen a lot of murals, but never an entire building. Kinda neat. Someone had fun painting that little building. The silos fit perfectly into the design of the building. You did an excellent job photographing the corner mural of the building . That's great! I love it when utility structures get beautified. Love it! So much more interesting than a plain little building! Fantastic. I am so grateful when mundane structures are transformed into works of art! !